Ernő Dohnányi was noted, like his compatriot Franz Liszt, for his versatility, embracing the roles of composer, teacher and conductor. He was also renowned as a concert pianist, a career kick-started by his graduation from the Budapest Music Academy in 1897. Two years previously he had completed his first Piano Quintet, which was enthusiastically endorsed by Brahms, a composer who greatly influenced the young Dohnányi. A second quintet followed nineteen years later in 1914 and, by then, the composer had found his own voice. The later work shows the influence of Hungarian folk traditions, especially the modal tonalities in the opening movement. Quite why the two Piano Quintets have never gained the popularity of those by Brahms, Schumann and Dvořák, suffering neglect both in the studio and concert hall, puzzles me. The first is tuneful, melodious, memorable and easily accessible. Perhaps the second doesn't immediately grab the attention to the same extent, and requires more concentrated attention by the listener. 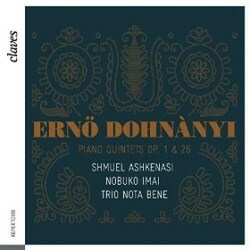 Dohnányi was only eighteen when he wrote his first piano quintet. Given the Op. 1, one would expect a work by a composer still learning the ropes. Quite the opposite, in fact. It is a composition of great maturity, where the influence of Brahms is clearly evident. The first movement is one of rugged passion, displaying a technical mastery of instrumental writing and melodic inventiveness. The Scherzo which follows could again have originated from the pen of Brahms. A central melodic section provides a lyrical contrast. Next there’s an Adagio, with strong hints of Schumann and a striking similarity to the slow movement of his Piano Quartet Op. 47. It is ushered in by the cello and the movement as a whole has a wistful and sombre feel. The Finale is extrovert with an underlying energy and vigour. A fugal section enters, clearly articulated by the performers and a Hungarian flavour pervades. The work ends with an upsurge of emotion. The Quintet No. 2, Op. 26, dating from 1914 when the composer was thirty-seven, is more introverted than its predecessor. Unlike Op. 1, it consists of only three movements. The first is portentous, with the strings playing a dark theme over a tremolo-type piano accompaniment. There are big dramatic gestures throughout, but at no point does the sun come out. The second subject in melancholic and is set in the minor. Throughout, there is great intensity in the writing. A tuneful Intermezzo follows in a lilting rhythm and there are capricious elements in parts. The Finale opens with the solo cello and one by one the other instruments make their entrance. The piano, last to come in, seems almost reluctant to show its hand, and takes a backseat for most of the movement. Once again the underlying mood is sombre. The tempo eventually quickens and the instruments become more involved in the ensuing drama yet the music never seems to smile. Peace eventually reigns at the end. The excellence of the audio quality is a distinguishing feature of this recording. The sound is bathed in a clear, warm acoustic conferring a palpable sense of intimacy. The engineers have achieved an ideal balance between the instrumentalists, who deliver intelligent and polished performances. Indeed, they prove worthy advocates of these marvellous but sadly neglected scores. Shmuel Ashkenasi and Nobuko Imai make sympathetic soulmates to the Trio Nota Bene. Claves has certainly done these works proud.